I first met Jared Whalen about 12 years ago. He started gabbing like he’d known me for years, and it didn’t take long for him to tell me how he’d once broken his arm but stayed on to work an entire shift. "No you didn’t," I thought. “Yes, he did,” Jean-Robert de Cavel* confirmed. Whalen had somehow managed to "grin and bear it" and got the job done. This is the kind of war story legends are made from. For many of today’s budding cooks and chefs, Whalen was in fact a legend. 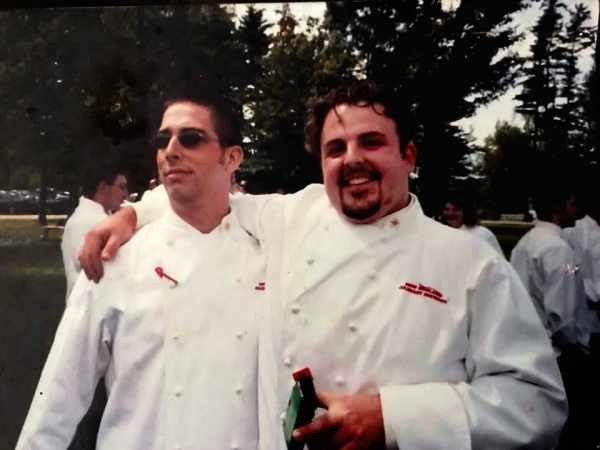 Affectionately nicknamed J-Rod, Chef Jared and even “chef dude,” Whalen suffered heart failure and passed away on August 20. He was 44. His passing has left his industry family reeling and heartbroken. The groundswell of grief-stricken voices is overwhelming—many seeking answers and many more wanting the world to know the person they just lost. 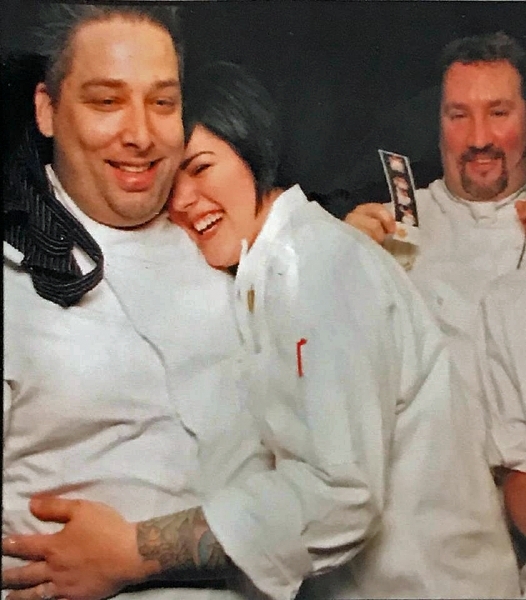 Whalen was a friend, brother, mentor, life of the party, chief consoler, warrior, prankster and very simply, an all-around badass chef whose passion, compassion and creativity knew no bounds. Which explains why he instantly treated me like his friend 12 years ago. We didn’t work together -- I was a culinary instructor and Whalen was the chef-de-cuisine at Pho Paris -- but we shot the breeze like old pals. Many under his charge considered him their friend, someone they could talk to well into the wee hours of the morning, or even jam with to The Grateful Dead while working to sous vide a ton of eggs late into the night. Whalen was one of those people who did not – could not – stop creating. He once told me he would run over to the restaurant kitchen in the dead of night to try out new dishes that popped in his head. He was obsessed with his craft. Whalen’s creativity defied norms and he encouraged – even dared – his cooks to do the same. “When I suggested a white chocolate wasabi mousse with raspberry gelée, his response was, ‘That sounds dope, do it,’” Genetti recounted. When mixology star Molly Wellman* first moved home from San Francisco 10 years ago, Whalen brought her in as the bartender. Wellmann said he set up a place in his kitchen where she could prepare her mixers, bitters and tinctures, and he even taught her about flavors—setting her on a path that’s taken her far. “Jared was a lovable guy and a strong leader,” de Cavel said. “He gave his knives away to the good cooks and forced people to be better.” A note about chef culture: chefs don’t give away their knives. Knives are practically an extension of a chef’s arm and the fact that Whalen did, shows how much his team meant to him. Whalen’s culinary genius flowed with a good measure of fun and promise of mischief. Stephen Williams* remembers well how Whalen would let out a “mad scientist cackle” whenever he went around the kitchen spontaneously creating new dishes—during dinner service. Stories of Whalen’s sense of humor are abound, ranging from restaurant floor mats getting switched around locations to the temporary “kidnapping” of de Cavel’s beloved la chouffe gnome. Sometimes I still wonder which cook got the wrath of Whalen’s wasabi trap those years ago. His eyes twinkled when he told me how he’d asked one of his new cooks to sample matcha ice-cream which was actually a ball of wasabi. The working conditions in the restaurant kitchen are as unforgiving as they are rewarding. The best and the worst of human nature are often on full display. That’s also why the restaurant industry tends to forge lifelong friends and in many cases, families. In his roughly 20-year culinary career, Whalen has shaped new chefs and leaders, raised the dining standards, and shown us how to work hard and still have fun. This week, the restaurant family lost one of its own. Many hearts are hurting and things will never be the same. But with every story shared, I see how Whalen has forever left his mark on the industry. Rest in peace, Chef. 1. Jean-Robert de Cavel, chef and owner, Jean-Robert’s Table, French Crust Café & Bistro, Restaurant L, Le Bar A Boeuf, Frenchie Fresh, Jean-Bob’s. Whalen worked for de Cavel at the Maisonette (2000), Pigall’s (2002), and headed up Pho Paris (2004) which later rebranded as Chalk Food+Wine (2008). He later joined Jean-Robert’s Table (2012) as chef de cuisine. 2. Christopher Ropp, owner and chef, Garnish Catering. Ropp was the executive chef at the Kenwood Country Club when Whalen came on board to become the executive sous chef. 3. Summer Genetti, Executive Pastry Chef at Michael Symon's Lola Bistro & Mabel's BBQ. Genetti was the pastry chef at Pho Paris and later, Chalk. 4. Roy Silcott, Equipment Specialist, TriMark SS Kemp in Pittsburgh, PA. Silcott and Whalen graduated from the New England Culinary Institute in 2000 and have spent the last 20 years working on and off for de Cavel. 5. Cristian Pietoso, chef and owner, Via Vite, Forno, Americano Burger Bar. Pietoso was Whalen’s peer, crossing paths at special events and fundraisers. 6. Andrew Vogel, adjunct culinary instructor at Midwest Culinary Institute. Vogel worked for Whalen at Jean-Robert’s Table. 7. Amy Hunter, Vice President of the Board and the Chair for the Friends and Family (SIDS) Brunch. Hunter’s involvement in community culinary classes and special events intersected with Whalen’s work. 8. Molly Wellmann, owner and mixologist, Myrtle’s Punch House, Japps Since 1879. Whalen was the chef de cuisine at Chalk Food+Wine when Wellmann came on board as the bartender. 9. Steven Shockley, chef de cuisine, The Anchor OTR. Shockley was the sous chef and pastry chef at Pho Paris and Chalk. 10. Eddie Travis Reidel, line cook, Gramercy Tavern, NYC. Reidel first worked with Whalen at the Kenwood Country Club and went on to become the chef de cuisine at Le Bar a Boeuf. 11. Stephen Williams, chef and owner, Bouquet Restaurant and Wine Bar. Williams worked for Whalen at Pho Paris from 2004-06. 12. Bhumin Desai, Executive Chef, Maplewood Kitchen and Bar. Desai took over as chef de cuisine when Whalen left in 2014. Grace Yek writes about food for WCPO Digital. She is a certified chef-de-cuisine with the American Culinary Federation, and a former chemical engineer. Connect with her on https://www.graceyek.com/.